The Reebok Stadium is quite simply one of the most impressive stadia in the country, and is very imposing on the Bolton skyline. The design is currently unique in the country, with the lower tier of the each stand being rectangular, and all the upper tiers semi circular (see photo). As with all new stadia, the ground is totally enclosed, and offers all seating. There is a large video screen in one of the corners, with all the usual 'permitted' highlights. One final unique point about the Reebok Stadium, is that the two teams emerge from separate tunnels, both on the halfway line, either side of the pitch. I wonder how Sky deals with this on their prematch tunnel shots? For away fans the facilities and atmosphere are excellent. Away fans are normally located the uper tier of the South stand behind one of the goal. This section will accommodate approx 3000 traveling fans. Clubs with larger followings, will also be allocated a third of the lower tier. The refreshments within the Reebok are also excellent, with a post office type queuing system in operation. When you get to the front, you will also be met by two assistants. One to take your order and money, and the other to get your food etc. Some would say that the only limitation for this ground is the approx 28,000 capacity. I disagree, as clearly Bolton know their audience, and have pitched the size of the stadium to match. Exit the M61 at junction 6, and take the first exit off the slip road roundabout onto the A6027 Mansell Way. Go straight over the roundabout and take the slip road for the car-parks. Horwich Parkway is immediately outside the stadium. There are 2000 spaces at the ground, including an away area (section A). As there are so few roads to park in around the stadium, because of it's out-of-town location, there is little alternative, and getting out after the game can take a while. This pub is located on Chorley New Road. The manager of the The Bee Hive has contacted us and says "The Bee Hive is a dedicated Away fan pub, showing Sky Sports and Setanta sports, before, during and after the match. Food is served before most matches and if the menu is taken off due to Police advice, then a selection of snacks are on sale behind the bar. We have a car park and there is no fee payable for customers." Located at the ground, and named after the last Bolton team to lift the FA cup. This establishment offers beer, and loads of fast food. Does tend to get rather crowded with home fans. This pub is a five minute walk from ground, in Lostock Lane. This pub is reasonably friendly and usually contains a mix of home and away fans. The pub offers excellent ale, a good friendly atmosphere, and the landlord, like The Beehive, also offers a car parking service at £2.50. Located on Lostock Lane, this is a down-to-earth pub which offers a wide food menu. 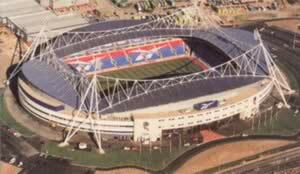 The Reebok Stadium is located on the Middlebrook Retail estate. Also contained on this retails estate are the following eateries... KFC, Burger King, Pizza Hut, a Bolton Wanderers themed McDonalds, and several other themed restaurants. If you are a registered user then you can login, and create your own personal review of Bolton Wanderers Football Club - Reebok Stadium. These reviews can be private or public.